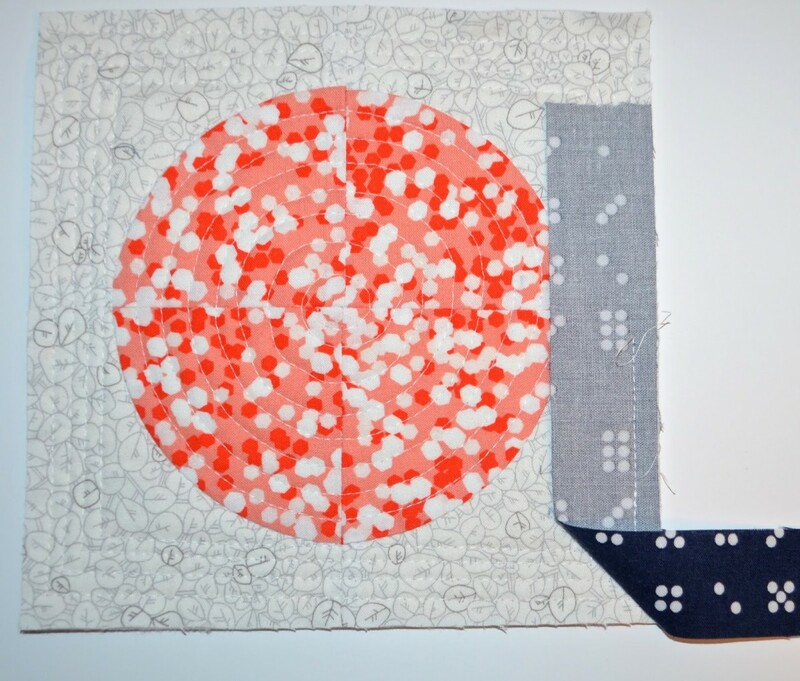 Hi, I’m Leanne and I blog at she can quilt. Some of you might know me from the 2013 FAL, which I hosted. 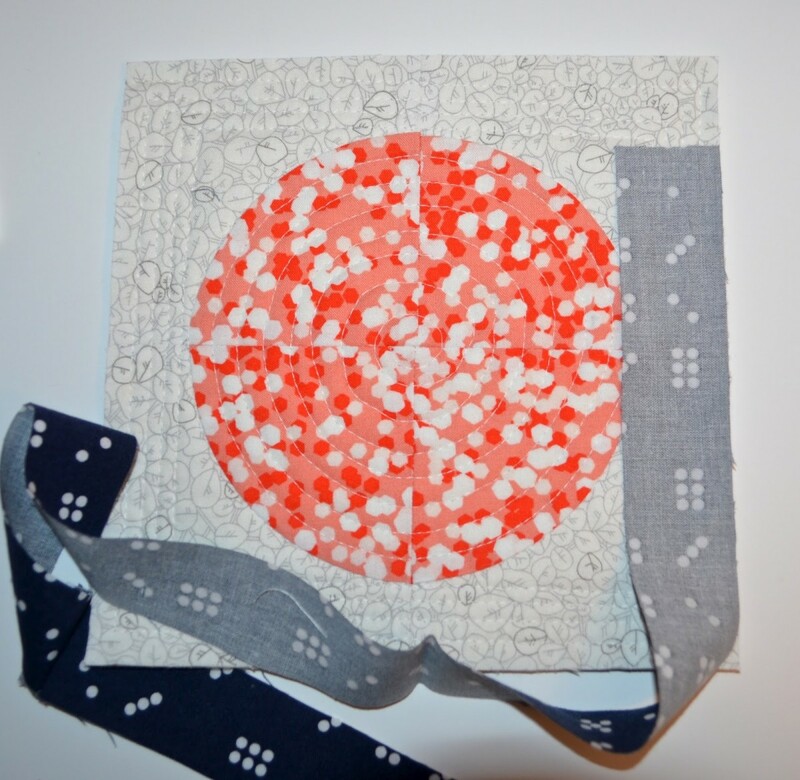 Today I am sharing a tutorial for adding a Single Fold Binding to your quilted project. I use this binding for mini quilts and smaller items as the regular double fold binding that I use on a quilt overwhelms these smaller pieces. Also, smaller pieces are not being slept under so they just don’t require the more durable double fold binding used on large quilts. Sandwich and quilt your project as usual. 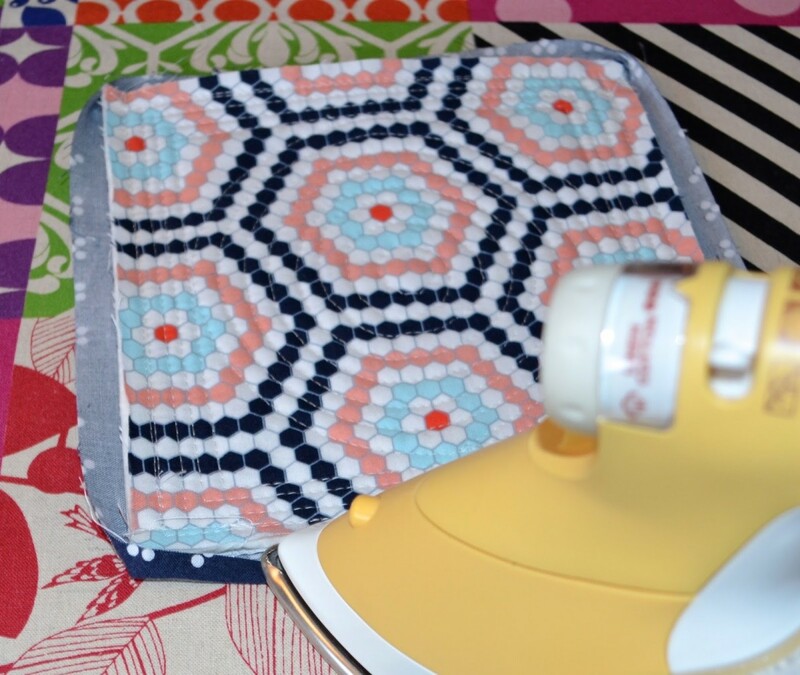 Today, I am making a mug rug. Trim the excess backing and batting/wadding away and square up your edges. 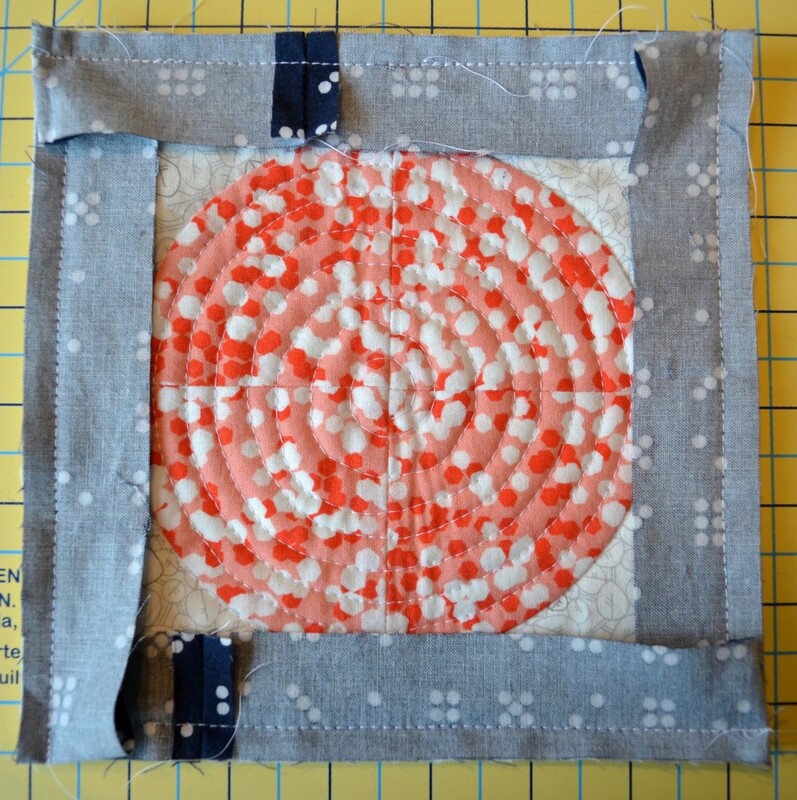 Cut your binding fabric to 1 1/4″ wide. To determine long your binding strip needs to be, measure your four sides, add the measurements together and then add about 5″. My mug rug is about 7 1/2″ on each side, so my maths is 7.5 + 7.5 + 7.5 + 7.5 + 5 = 35″. 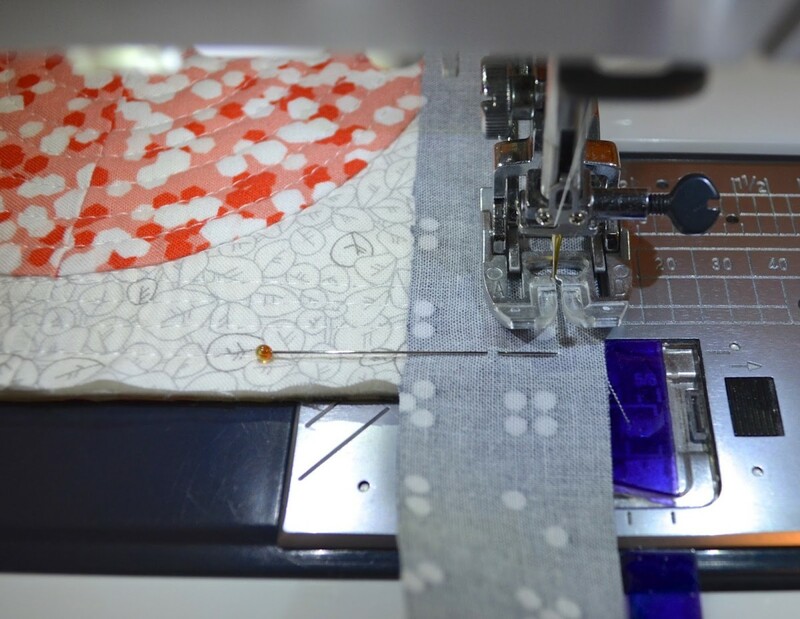 As I was cutting the binding from a fat quarter, I cut two 1 1/4″ wide strips off the fat quarter and sewed them together to make a continuous binding strip that was long enough. I sew the strips together horizontally, but if you like to sew your binding together on a 45 degree angle you should do so, either works. Start sewing your binding about mid edge, leaving a length unsewn. The amount left unsewn is going to depend on the size of your small piece, but try aim for about 2″ or more if possible. Stitch the binding on to the edge of the mini quilt using a 1/4″ seam allowance, right side of the binding facing the top of the quilt. I use a walking foot to stitch on my binding to get nice even stitches. Also, I use a longer stitch length than usual which leaves room for the thread to go through all the layers without puckering. 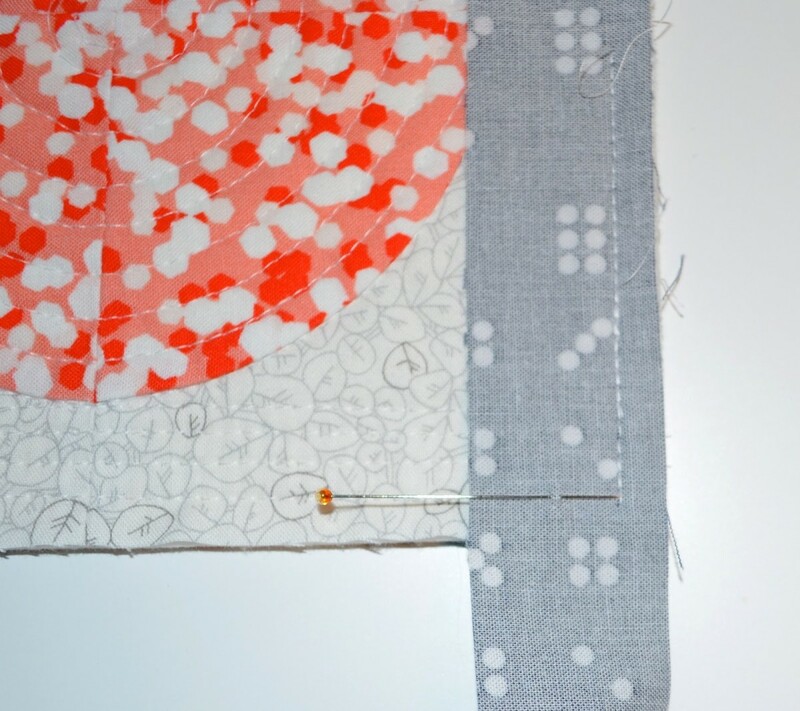 As I approach the end of the edge, I add a pin to mark 1/4″ before the end. 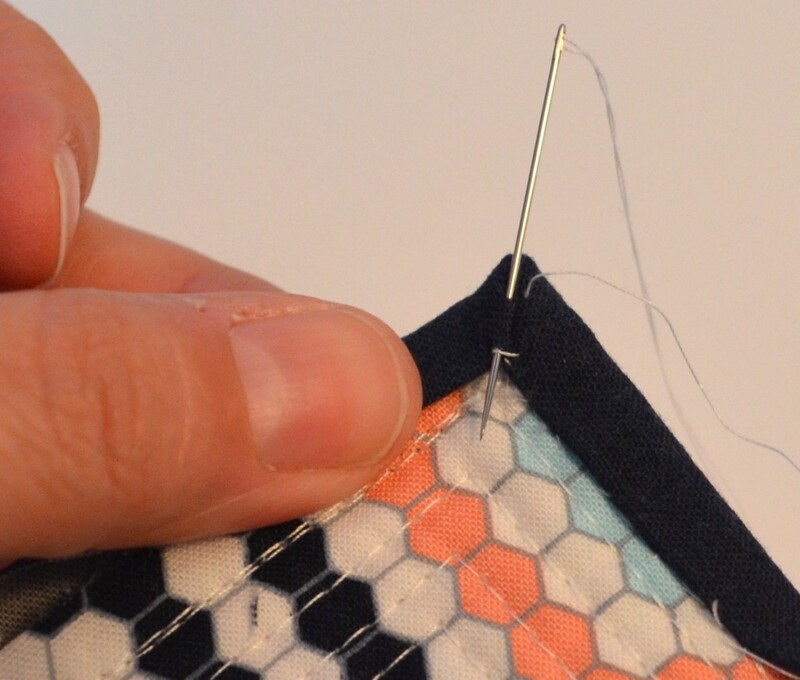 Stop stitching 1/4″ before the end of the side, back stitch and cut your threads. I should mention that some people, instead stop stitching and pivot to 45 degrees and stitch off the corner, and if that is your usual practice, it works well too. To mitre the corner, fold the binding back off the side of the quilt as shown to get a 45 degree angle fold. Finger press that fold. The photo above was snapped just a moment too early. You can see that the bottom of the binding is not parallel the the next side, and it needs to be. 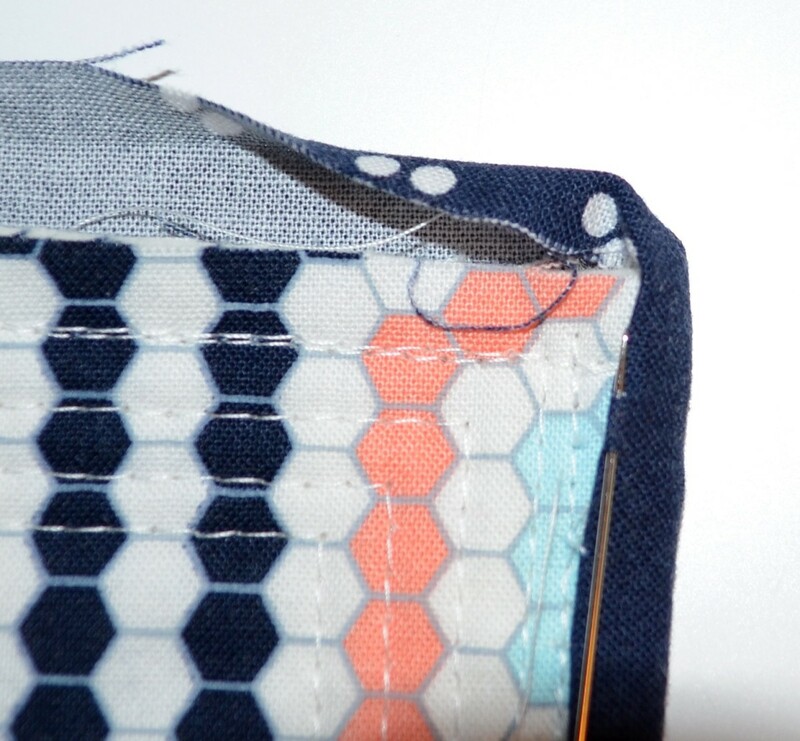 The binding should be folded back a bit more than the photo shows so that it lines up right along the line that next quilt edge creates before you do the finger pressing. 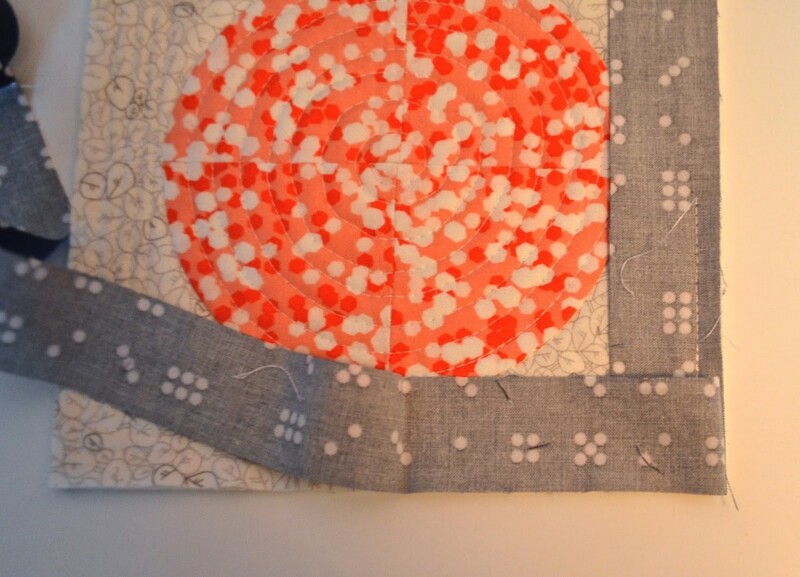 Carefully preserving the 45 degree fold you just made, fold the binding over it and along the next edge of the quilt. Make sure that there is a nice fold parallel to the edge and that the binding is now lined up along the very edge of the quilt. I stitch a few stitches, starting at the very edge, backstitch, and then stitch along until I reach the next corner. 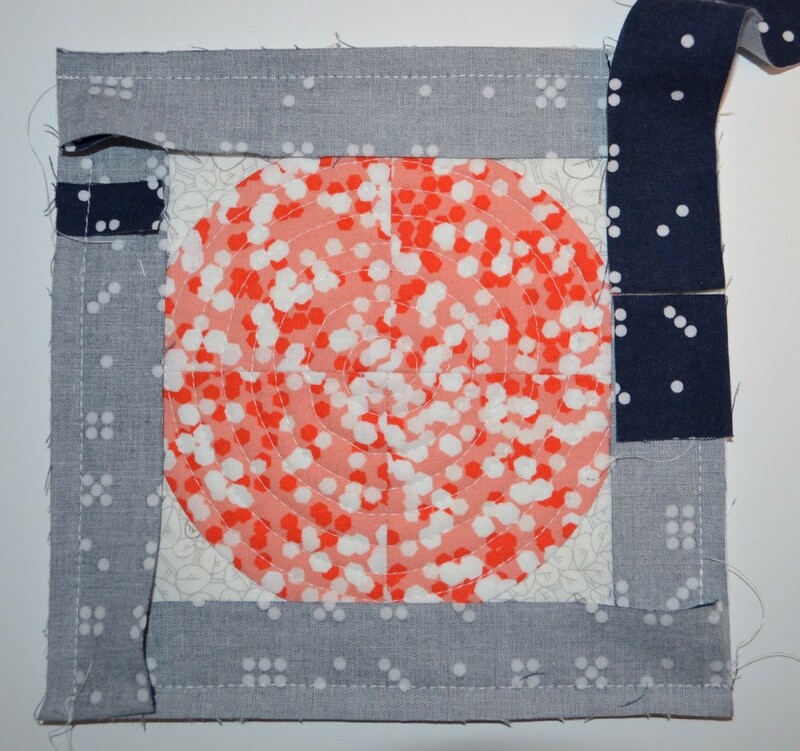 Continue along the edges of the quilt until you have turned the last corner. Stitch a ways along from the corner and stop. Cut your threads. I join the end and start of the binding horizontally. First I line up the ends of the binding so that they just meet and fold them back on themselves. Finger press. Carefully open the two finger pressed pieces and line up the pressed lines, right sides together. Pin in place. You will have to fold up your mini quilt to do this. Stitch along the fold line. 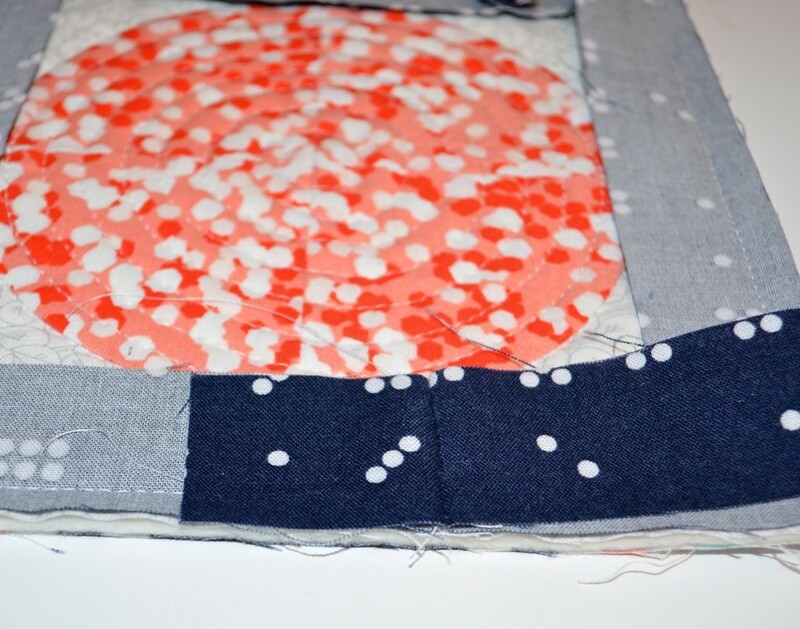 After the fold lines are stitched, open the mini quilt and check to see if the binding lies smoothly. If it is too loose, stitch another line inside the first one. If it is too tight, stitch a line outside. 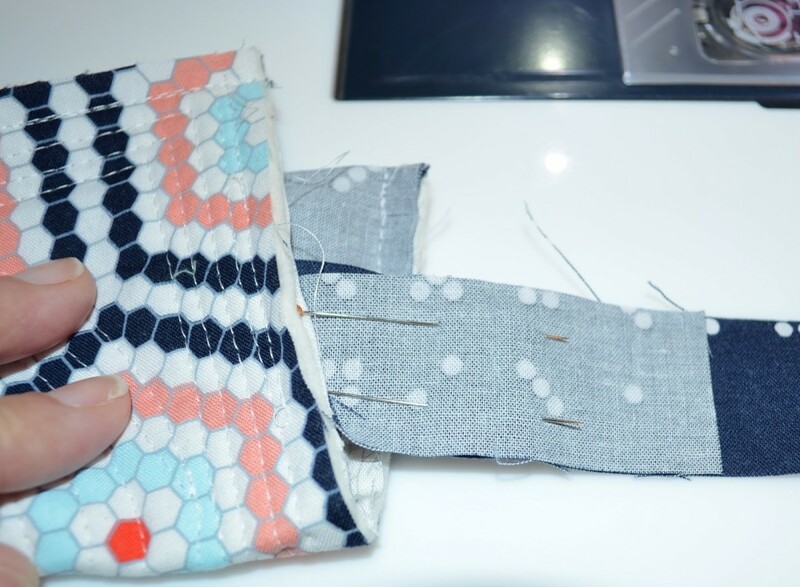 Then unpick the first stitching line – leaving it in place means you don’t have to repin and aline everything up before stitching. When you are satisfied that the binding lies smoothly, trim the seam allowances to about 1/4″ and stitch the remaining edge of the binding. Again, if you prefer to join your binding at a 45 degree angle, use your usual method here. 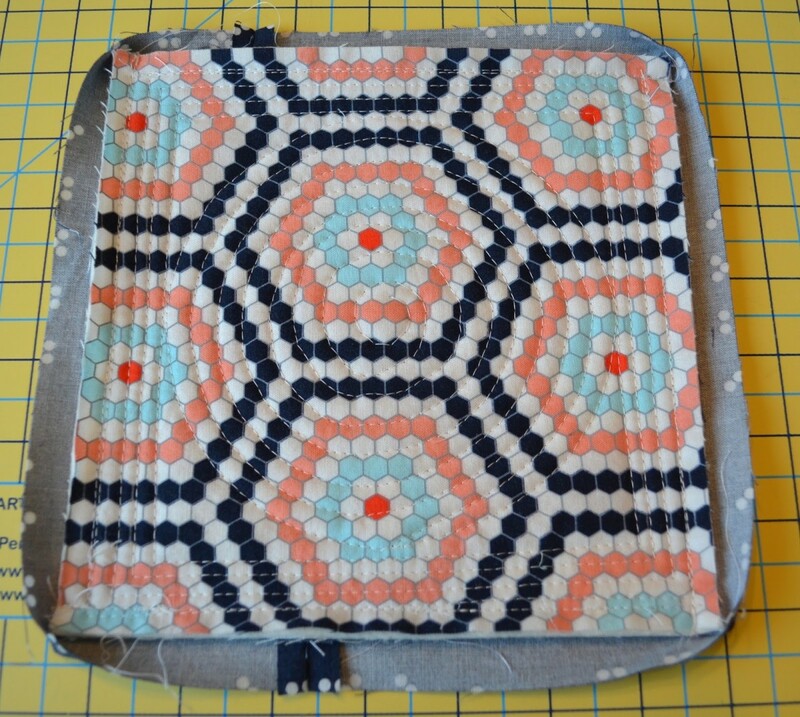 Here is how the stitching looks on the binding on my mug rug. 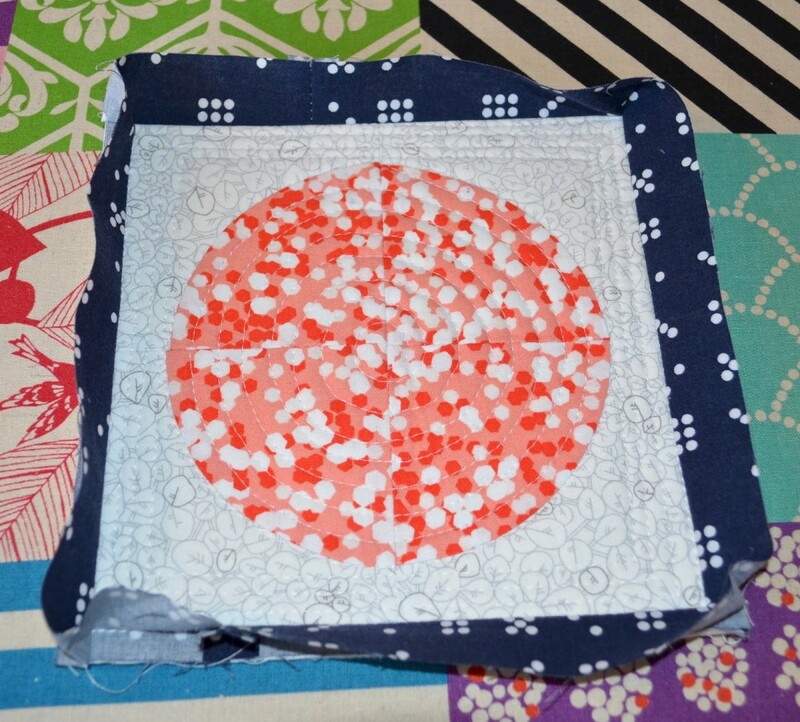 Next, press the binding away from the mini quilt all the way around. Don’t press the corners. 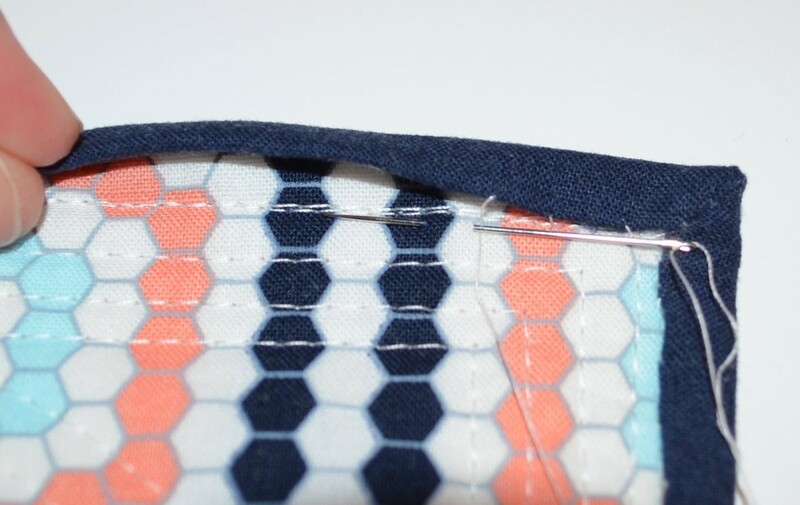 Given how thin this binding is, make sure that you press it right at the seam line away from the mini quilt all the way around. Turn to the back and flip over all corners. 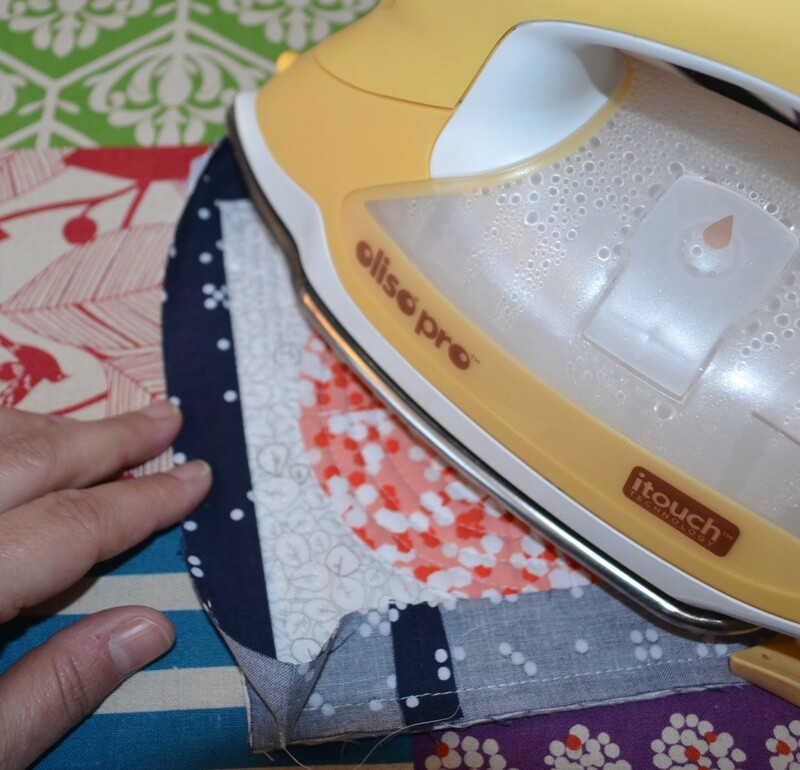 Moving carefully with no steam so you do not burn your fingers, press the edge of the binding to meet the edge of the quilt. You are pressing up about 1/4″. Press all the way around, leaving the corners alone. 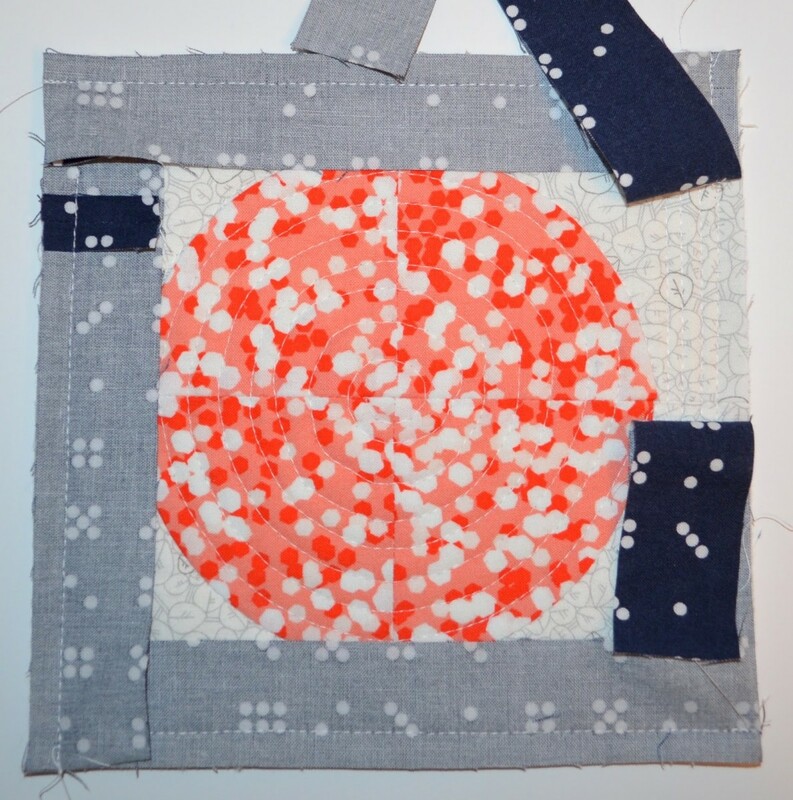 I always stitch the binding of a mini quilt or smaller item down by hand. It only takes a short while and is so much neater than any attempt to machine stitch this smaller width. I use a ladder or mattress stitch as shown above. 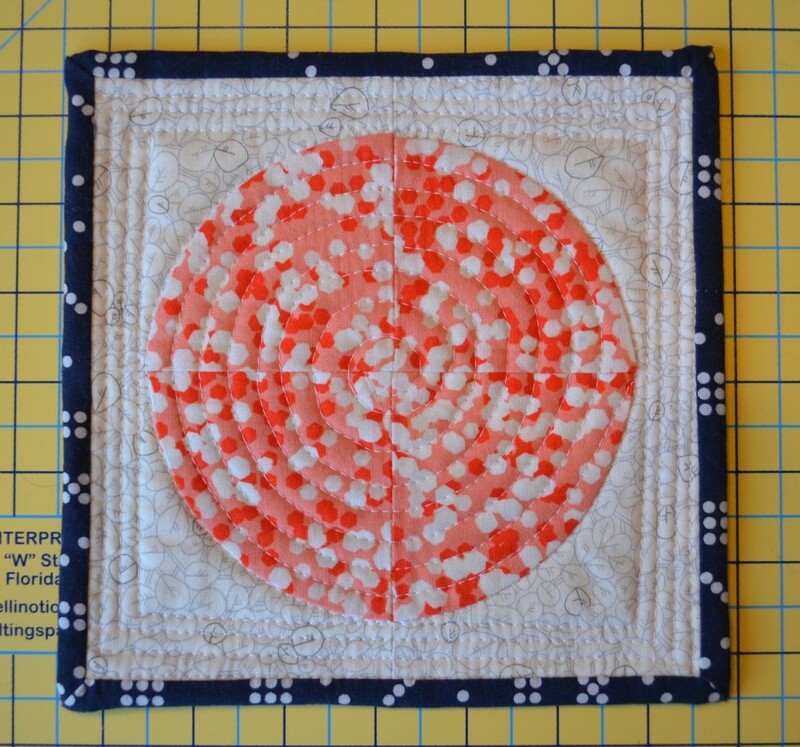 Move the needle under about 1/4″ of the back of the quilt (being careful not to go through the front of it). 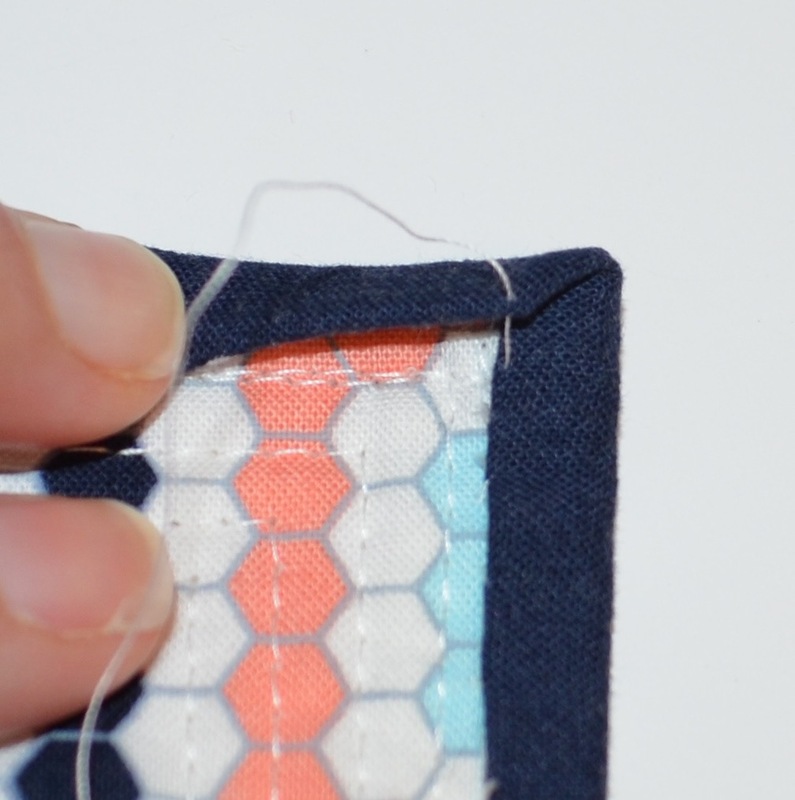 Then move the needle through about 1/4″ of the binding along the fold and continue. I try to stitch just on the inside of the stitching line that attached the binding to the front of the quilt and using this line for reference will keep your binding nice and straight on the back of the piece. I start stitching about mid way along a side of the binding. Refold the pressed seam and carefully pull the binding smooth along the edge of the quilt as you stitch. You will note that I do not pin or clip my binding before I start sewing it as i find that it is just annoying to do so. I line up each bit carefully as I go, but if you like to pin or clip, please do so. As you reach a corner, fold the corner as shown above. you are aiming to have the binding fold continue off the side while the 1/4″ fold of the next side is maintained so naturally a 45 degree angle fold will be produced. Take time to get this fold to look nice. Then fold the next side’s binding in place and the nice mitred corner will appear. I then stitch (and if necessary I just take a tiny extra stitch) so that the needle comes up right under the corner, I move the needle through the bottom binding and then the top binding of the corner as shown. Then take a stitch through the binding on the bottom of the fold toward the corner, come up a bit before the actual corner, and take a stitch through the top binding, coming out right at the edge of the corner. The photo above should make this more clear. Pull this all tight and start the new side right at the corner again. Looking at the above photo again, you can see how the corner has been turned and the stitching along the second side starts. Continue around the entire binding and tie off. Here is the back of my completed mug rug. You can see that not every corner has come out perfect but they are all good enough. This method leaves just this nice 1/4″ of binding on the back. 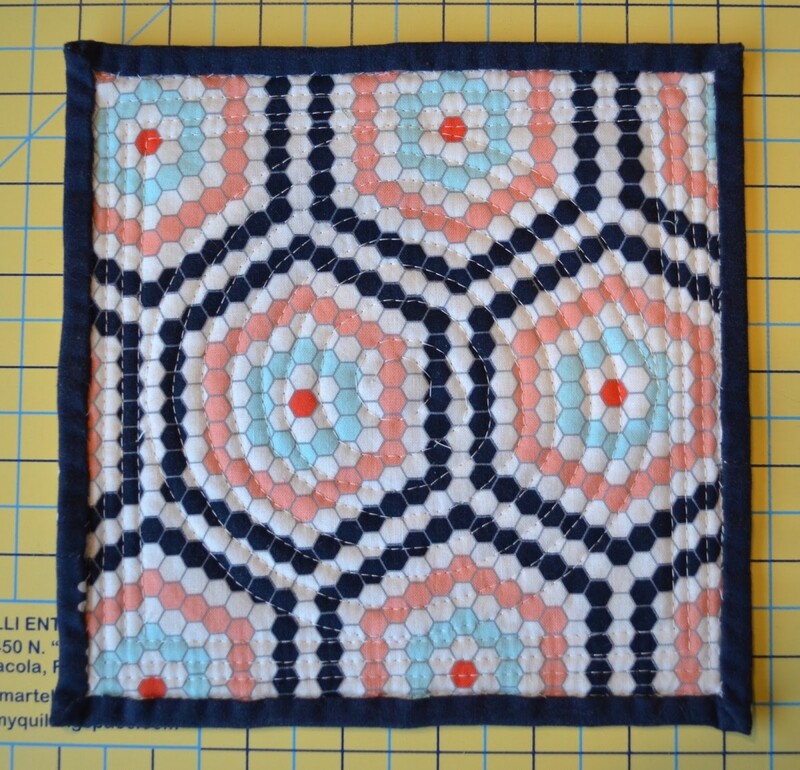 Here is the front of the completed mug rug. The single fold binding gives a nice 1/4″ edge to the small quilt which is not too thick. This binding compliments rather than overwhelms the smaller project. 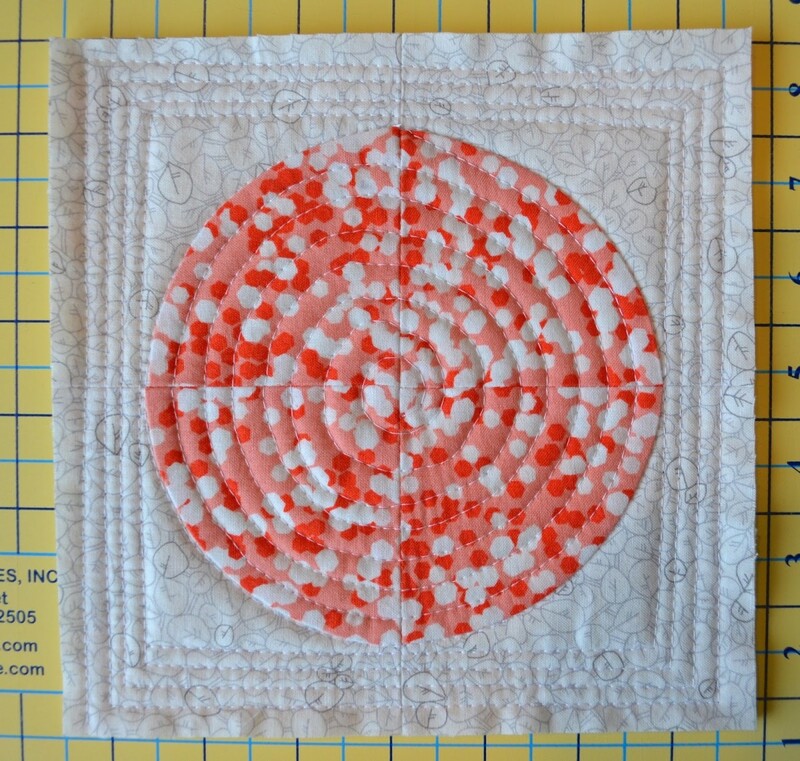 Thank you to Katy – who has been a most excellent 2014 FAL host – for including me in the Finish Along Tutorial Series. 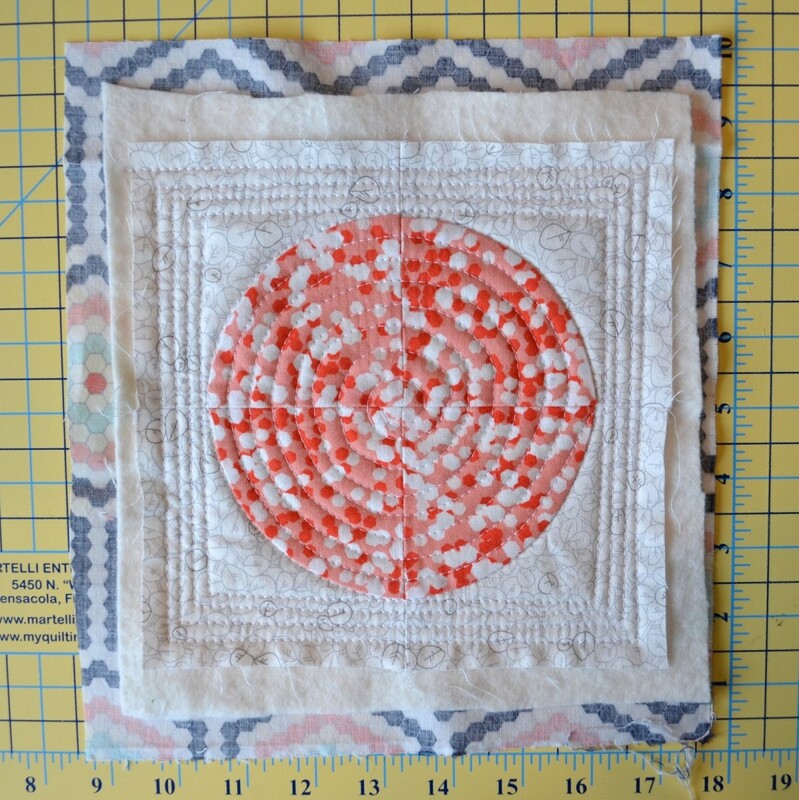 Please let me know if you have any questions, either in the comments here or over at my blog, she can quilt. Nice tutorial! I agree that single fold binding is definitely more appropriate for smaller items than the double fold we use on larger quilts. Great tutorial Leanne, I have been meaning to do one of these for ages for my students – now I can just send them here! I use single fold binding for everything, I have large quilts that have been continually used and washed for 20 years and there is no problem with single fold binding, I think double fold is a fabric company conspiracy!